Em's Knitty Corner: Picture time!!! Next off, today I got a super package in the mail : my sockapaloooza socks!! Don't they look super? They are even more perfect in reality! 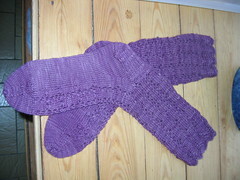 They were made by Jo with natural painted yarn by Hand Jive Knits and she used a pattern from Nancy Bush' Knitting Vintage socks. She included a lovely letter. Dear, thank you so much! They fit perfectly and I love the colour! Don't worry about the difference, I've done natural dyeing so I know you can't get perfect results! I love the colour and the pattern, thank you so much! I have a bit of big thing to tell you all but I'll probably keep it till tomorrow. I'm so insecure about this, but I just want to give it a try. So come back tomorrow to read about it! I like your handspun and can't wait to hear your "surprise". 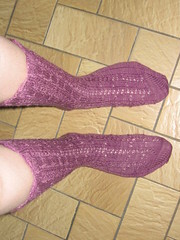 Beautiful handspun, and sockapaloooza socks too! You are sooo pretty! And the vest is too! Nice work Chickie! 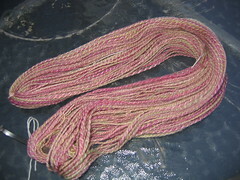 So, what do you intend to do with that lovely handspun?? 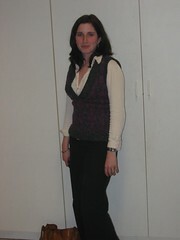 Your vest turned out great - it fits you wonderfully! Pictures of my Norwegian Stockings!